The ancient Egyptian people believed the powerful sun and the mysterious Nile River were gifts from their gods. They believed their pharaoh was both a person and a god, descended from the same gods that provided their land with great wealth. The Egyptians wanted their pharaoh to make a successful journey to the afterlife so he could continue to provide Egypt with the sun and the river. For that to happen, the pharaoh’s body had to remain intact and on Egyptian land. The Egyptians buried their pharaohs with food and the ruler’s most treasured objects; they believed the spiritual essence of the objects would comfort the pharaoh as he traveled through the underworld on his journey to the afterlife. The early pharaohs were buried in the Egyptian sand, but their bodies were easy prey for jackals. 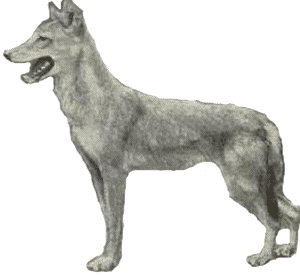 Jackals are wolf-like creatures that prowl the desert for decayed flesh. The Egyptian people protected the bodies of the pharaohs by surrounding the pharaoh’s graves with mud pits. Archeologists found bodies buried about 3400BCE that were largely intact. The dry sand preserved the bodies even better than the elaborate techniques the Egyptians used later in their history. The tombs of the early pharaohs were covered with a mud brick slab called a mastaba. The mastaba was a landmark that identified the burial place and allowed the Egyptian people a place to pay their respects to the body of their ruler. The mastaba also protected the pharaoh’s body from jackals. Imhotep was a brilliant architect who built an elaborate monument for his pharaoh, Zoser, more than 26 centuries before the Common Era. Imhotep placed six mastabas over Zoser’s grave. Each mastaba was smaller than the one below it. Imhotep then covered the mastabas with polished white limestone. 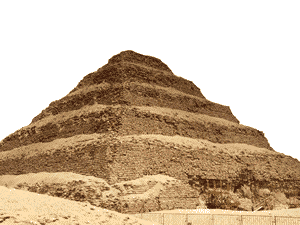 The result was the Step Pyramid of Zoser, a structure that rose 203 feet into the sky. Egyptian pharaohs built pyramids from the time of Zoser to about 1700BCE. Most pyramids were built as tombs for the pharaohs or their closest advisors. Archaeologists have found 138 pyramids, though others may have been destroyed or remain hidden beneath the desert sand. The Great Pyramid at Giza is the largest of the Egyptian pyramids, standing 450 feet tall, covering an area larger than ninety football fields and containing more than two million stones. The largest of the stones weigh 160,000 pounds and had to be transported more than 500 miles to Giza. Historians estimate that it took over 100,000 workers more than twenty years to build the Great Pyramid. The ancient Egyptians did not have large animals to help them carry the massive stones, and at the time of the construction of the Great Pyramid, the Egyptians had not yet discovered the iron tools. The huge blocks were cut from a quarry using copper chisels and dragged across the desert in great sleds. The weight of the stones would have stranded wheeled vehicles in the sand. The workers were probably Egyptian farmers who were idle during the season when their farmland was flooded by the Nile River. 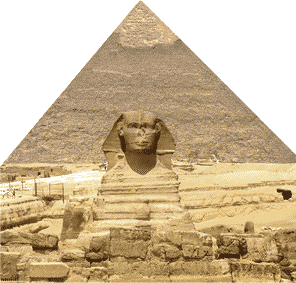 The Greek writer Herodotus described the pyramids as one of the wonders of the ancient world. Centuries after the end of the era of the pharaohs, the pyramids remain a symbol of the achievements of ancient Egypt. The Great Pyramid at Giza is the largest of the Egyptian pyramids, standing 450 feet tall, and 756 feet long on each side. It is made up of 2,300,000 blocks of stone, each averaging about 5000 pounds. The Egyptian Jackal fed on decayed flesh, so the Egyptians protected the bodies of their kings by burying them in mid lines pits covered by a large stone called a mastaba. The first Egyptian pyramid was the Step Pyramid of Zosher, constructed by Imhotep in the 27th century BCE. 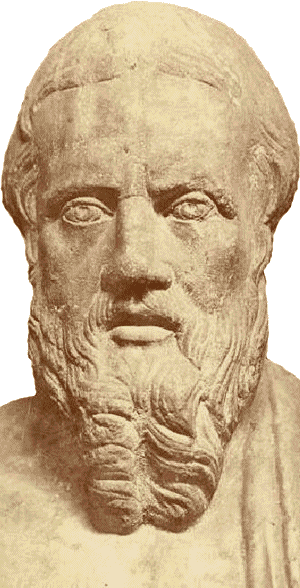 Herodotus (c. 484BCE–c. 425BCE), was is often referred to as “The Father of History.” Prior to the fifth century BCE, stories of the past were based on myths and legends, but Herodotus invented the systematic, thorough study of the past that attempted to explain the causes of events.